Because our full and partial pool cleaning service programs include both the chemical maintenance and pool cleaning; the water treatment is guaranteed. We also guarantee our workmanship on the cleaning of your swimming pool. See below for details on how each of our guarantees work. We use the 100% satisfaction guarantee badge on the items where a full refund is offered. This Guarantee further means we will issue a full refund on the pool cleaning service visit in question if you reported it within the first 36 hours and we were unable to re-clean the swimming pool to your satisfaction. This Guarantee means if you find that a Pool Maintenance Report is not filled out then we will issue a full refund for each service visit that is not documented on the report. Chemicals and chemical levels covered in this water balance guarantee include: chlorine, elimination of chloramines, pH (potential hydrogen), TA (Total Alkalinity), and Salt if your pool has a working salt generator. Startup chemicals such as Cyanuric Acid (also known as Stabilizer or Conditioner) and Calcium are necessary to convert tap water to water that can be balanced and maintain chlorine in a swimming pool. If your pool water encounters this situation we can give you a quote for the full or partial water change. 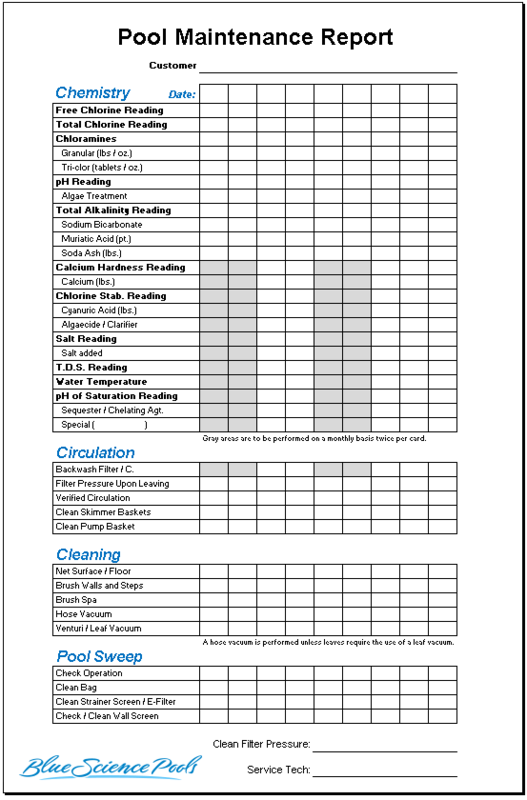 If the water change is performed by a customer or another swimming pool service company and startup chemicals are not added then Dallas Pool Service & Repair will quote the cost of adding the startup chemicals necessary that are not included in our regular "Full" or "Partial" pool cleaning service programs. Total Dissolved Solids (TDS) are excluded. A full or partial water change is also often needed every 3-6 years for impurities in the tap water that will creep up over time. These impurities are an additional item (separate from Cyanuric Acid and Calcium) often referred to with the catch-all term "Total Dissolved Solids" or "TDS". Customers on either our full or partial pool cleaning service programs can also expect we will correct any yellow, mustard, or green algae issues at no additional charge provided the swimming pool and equipment have been kept in proper working order and are running the appropriate amount of time each day, there is not landscaping in the water, and service has not been interrupted. It is important that customers keep their pool water level at a proper level for their pool equipment to be operational and that each pump is operated on an appropriate amount of hours on a daily basis. It is helpful to keep in mind that outdoor swimming pools are open systems and as such, are subject to whatever is blowing around in the air or the yard. Algae spores just like germs are constantly being introduced to swimming pools and killed. There are some strands of algae here in Texas that are chlorine resistant to more then 20 ppm. If one of those strands is introduced it can take hold and bloom even in a perfectly balanced and cleaned pool depending on the circumstances. While no swimming pool service company can guarantee this will never happen, what we can do is guarantee to resolve it for ongoing pool service customers free of charge.